Hair spray powered by air and not greenhouse gases. Looking for a finished shine to complete your look? Our unique hair spray, infused with Coconut Milk, helps provide a soft hold with glimmering, all over shine. Blended with the spirit of White Jasmine to keep hair fresh and fragrant. This hair spray is also 95% Naturally Derived and cruelty-free, paraben-free, & alcohol-free. Read our Naturally Derived Page to find out more. Say a great big yes to softly styled tresses. 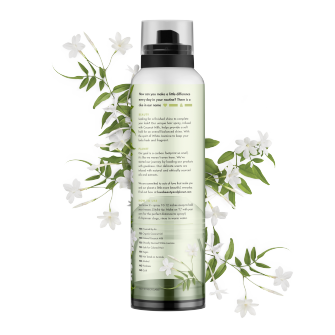 Our Coconut and White Jasmine Soft Hold & Shine Hair Spray helps provide long-lasting style with a hint of shine. This hairspray is powered by air, not greenhouse gases - Yay! Giving a little love to the planet. Soft hair has never felt so good. Simply spray over your hair for a shiny and smooth finish that lasts. That means light hold without all the stiffness for a beautifully flexible look. Found swaying high in the warm, humid skies of tropical islands like the Philippines, Hawaii and Polynesia, Coconut Milk comes from the sweet, nutrient-rich kernel of the coconut. This hair spray combines the goodness of Coconut Milk with a burst of ethically sourced infused Jasmine. Hailing from Egypt, Jasmine exudes an intensely floral, warm, and decadent scent. soft hold & shine coconut milk & white jasmine hair spray is rated 4.3 out of 5 by 105. Rated 5 out of 5 by jakaylaj6d6f from I received this hairspray for free to review and I must say it is now a favorite of mine. I wanted to use it a few times for a few different things so i could give a honest and in depth review. I used it as a finishing spray and it gave my curls a soft hold. I also used it to lay down fly aways on my wigs and it laid them down perfectly. This hairspray also has a very nice smell, it doesn't smell all alcohol-ish and it's not a regular aerosol can. You don't have to worry about all the unnecessary fumes like regular hairspray, the love beauty and planet sprays in a very fine mist that's not too overwhelming. I would highly recommend this product. Rated 4 out of 5 by goldenpineapple from As a stylist Im not fond of the packaging, its a great concept but I believe in getting every dollars worth. The product its self smells wonderful and light and the product itself is kinda sticky which Im not huge fan of I find sticky hair sprays tend to leave build up but only time will tell. However it does hold and add shine which is wonderful, it doesnt get crunchy or even look like I have hair spray in my hair which is a big deal, I also tried it on my extensions which are loonnnggg and they held really well with the spray, so all in all I would recommend this and potentially sell it in my salon to my clients who want a more holistic product! Rated 5 out of 5 by ekaterina_m from First, I was blown away by the appearance of the bottle. The design is just beautiful! I spritzed it around me to have a scent test, and WOW! The scent is euphoric and non aerosol like other sprays, which is a great plus. I have already used this pray a couple of times, and while it does give a slight hold, it does mostly give off shine. I don't mind it because I don't like it when my hair look like tree branches. My hair don't look crunchy/stiff, the smell amazing, and I'm pretty sure I can blind people with all that shine lol I was generally impressed with this product, and you can't ignore the fact that this company not also creates great products that are free of harmful chemicals, but also vegan. Rated 5 out of 5 by Anonymous from I got this hearse pay as a part of an Vox Box, and all I can say is thank you! The appearance on the outside is super sheik. The nonstop flow of the nozzle is super helpful for me as I have arthritis and find the constant spritzing hurtful to my fingers. It smells so good! It has a light coconut smell, but that Jasmine hits your nose and its euphoric. I have wavy to curly hair and the lights hold of the hairspray is the perfect balance for my long hair as it holds a curl, but it lets me be playful with it as well. I can't think influenced are enough for letting me try this. Rated 4 out of 5 by mistydh91 from First of all let me just say that the smell is amazing!!! I used it underneath my hair to give me a nice fuller hair look with a hold to keep it that way and it worked perfectly for that. It was the perfect hold for a look like that if the hold would've been any stronger my under hair would have been straw like and I hate that feeling. This left my hair full and not stiff at all. 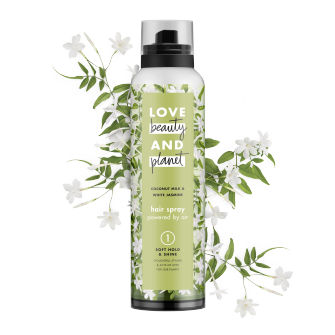 I can honestly say I was thoroughly impressed with this product and you can't beat the fact that they are working to not only provide great hair care but work towards a healthier planet as well. Rated 4 out of 5 by amandamb988 from I received this product complimentary in a #voxbox to test! I used it everyday this week. Upon first opening it, it had a very strong smell and I was a little worried how it would smell on my hair. Once I sprayed it I really loved the smell, very natural and refreshing! The hold is just a light hold, just enough to keep my baby hairs at bay. This is not a super strong crunchy hair spray & it will not leave behind any flaky residue, which I love. All in all it is a great product and I am glad Influenster sent this complimentary product for me to try out!